Indian food is often considered to be all about curries, spice rubs and lovely homemade breads. Sure, we love them, that's why they are famous right. 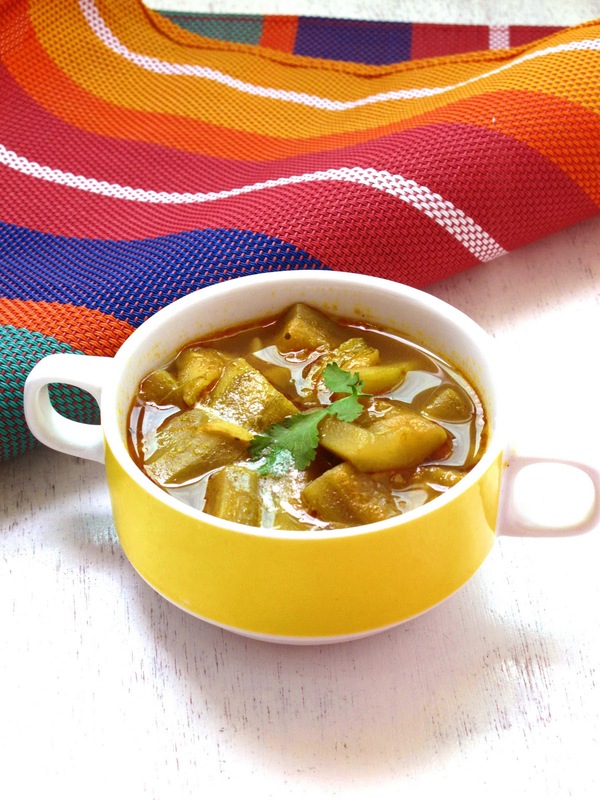 But apart from the mainstream Indian food that you get served in the restaurants, many vegetables like bottle gourd are hardly ever promoted on the menu even though dudhi or lauki (as called in Hindi) is widely used in Indian cuisine. From deep fried dumplings, stews, kebabs to halwas, due to its neutral and slightly sweet taste it is a very versatile vegetable indeed. Shaped like a long bottle, I learned from Wiki that more than eating, it was harvested in ancient times to serve as a bottle, and hence the name. Its also called white gourd, bottle squash and calabash. 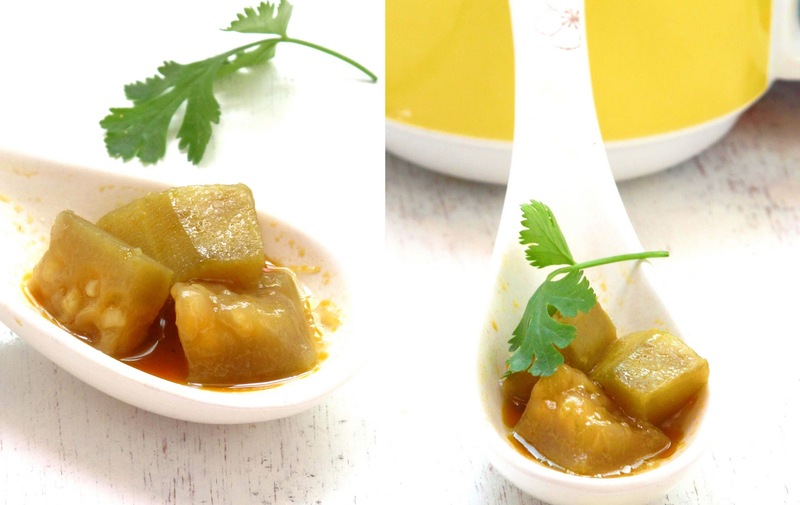 The ancient Ayurveda makes extensive use of dudhi and the cooked vegetable has a cooling and sedative effect. It also gives a feeling of relaxation after eating it. As a teenager kid, I hated bottle gourd. The day mom made it, I would declare a war, a hunger strike and I would engage in all kind of unethical bribing for my younger siblings to lure them in joining my war. The bribing included money, internet hours, T.V. hours , couch ( yes I had a couch dedicated to myself ) hour. But my mom was not the type to give up.Stay hungry or eat, these were the only two options. And I ultimately used to give in. Once you get to eating it though, I never remember disliking the taste, it was just the idea of eating something so not "happening" that was repelling, and not really the taste. The think the similar theory works for restaurants as well. 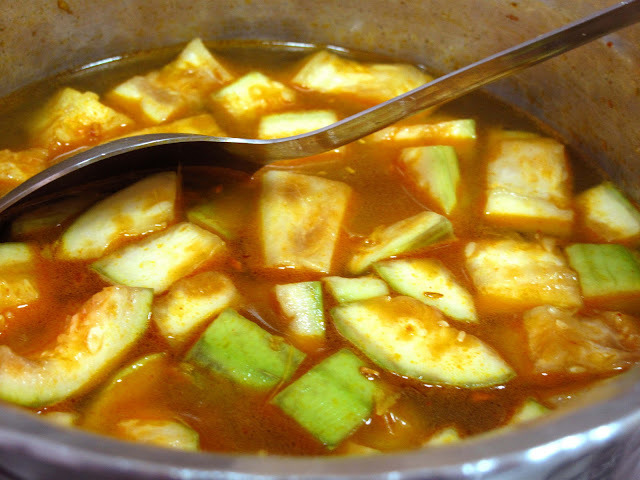 A simple bottle gourd soup is not considered a hip, a trendy thing to serve. 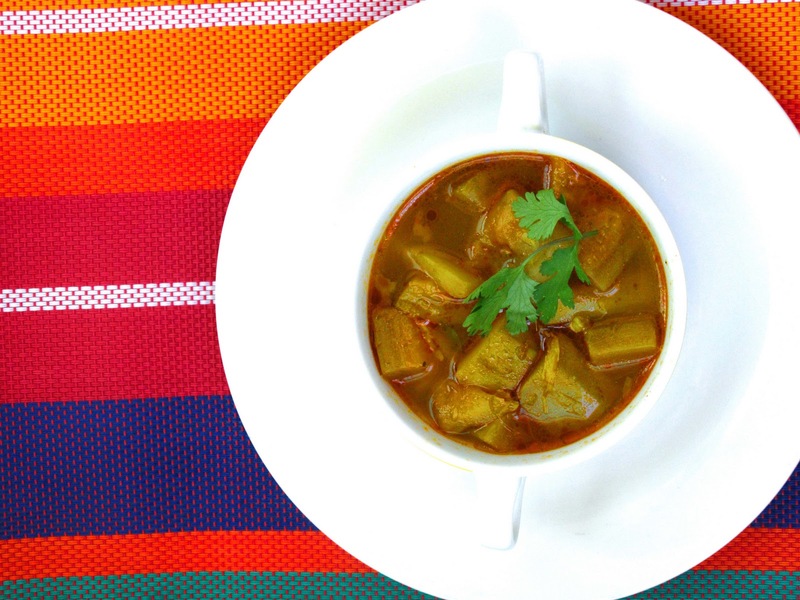 Here's a simple recipe for dudhi soup perfect for winters. 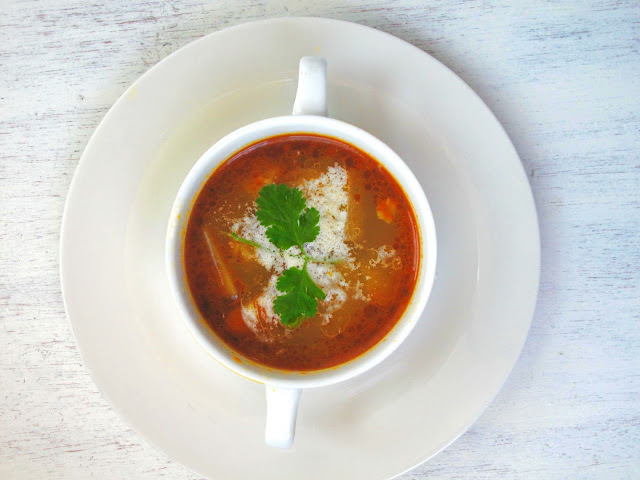 If you have not tried this extremely healthy, versatile vegetable yet, starting with this clean flavored with minimal ingredients soup should be your best bet. 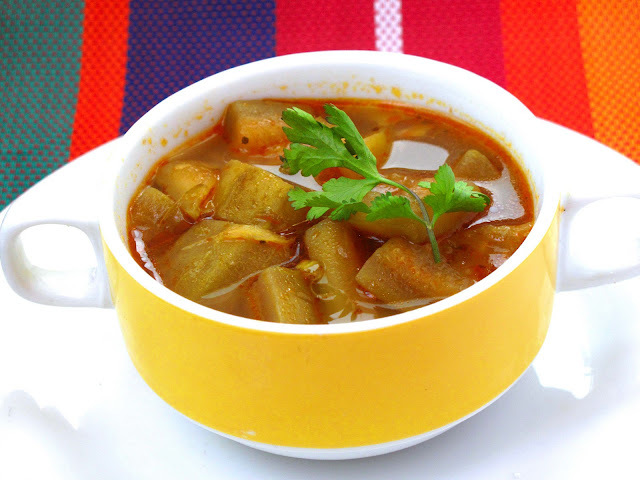 * A medium size, tender and firm bottle gourd is best for this soup. A buying tip is to look for thin bottle gourd with light green color skin which looks fresh without any dark spots on it. **I like to use a mild and smoky variety of green chilly which is locally grown here but just about any type would do. 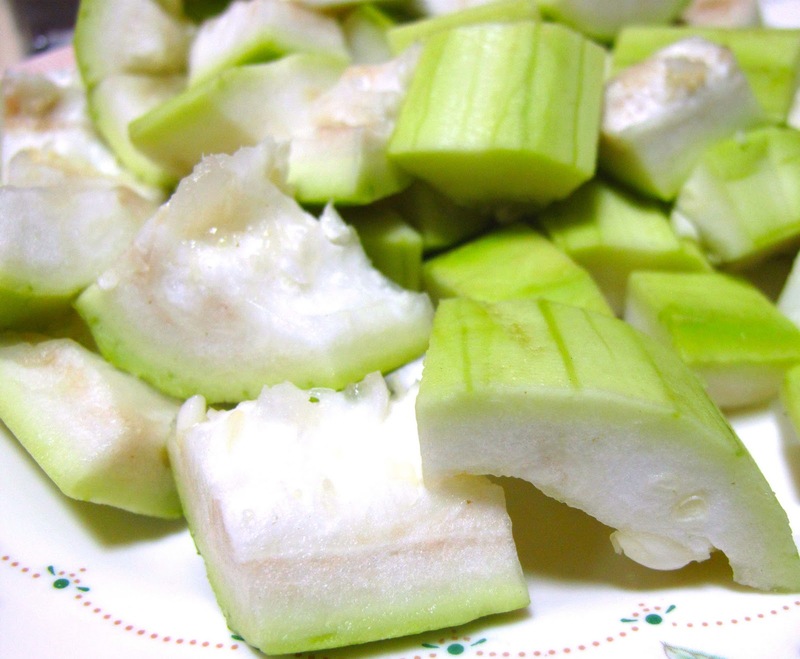 Peel and scope the seeds off the bottle gourd. Cut into cubes. Add the chicken stock. and let it cook for 30 minutes without lid. 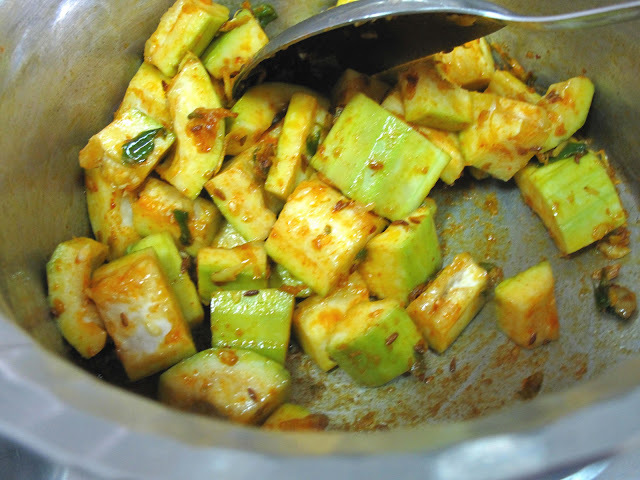 Add salt and pepper to taste and cook covered for another 15-20 minutes until the bottle gourd is cooked through and it is fork tender. Take it off the heat and add the lemon juice. Garnish with coriander and add a dash of butter. Don't omit the butter. I'm sure there's a study that says little butter is good for you. I like to sip on it just like a soup but M likes to have it with khichdi ( Indian rice and lentils) and Indian mango pickle. And I always lost the food war against my parents: They had an unfair edge, though - they knew I had to eat at some point, and couldn't hold out forever! I used to have Bohra neighbours who used to make a dessert with duhi and milk...such a versatile vegetable! never cooked dushi like this...but looks perfect and delicious. You know I also didnt like lauki,turai,kadhi, mangoori and a lots of things as a kid..but now I have a taste for them.My mum says that you should keep in trying things, you never know when u'll start liking them :) I make lauki with cumin, hing,tomatoes & green chillies & like your recipe with masala also..Love it a lot a summer vegetable though..light & watery.I will try with ginger & garlic next I get some good mexican one out here..Indian store ones are pretty sad! I dun know why I have so much to say but there are a couple of lauki things I have to post too on my blog! Have a nice weekend! This looks super delicious! Beautiful photos! good one ! lovely clicks !! Very nice. Interesting soup using a bottle gourd. No doubt that I would enjoy this dish too. Kulsum this dish sounds amazing! I have never cooked with this vegetable..I think I have seen it at my local Indian grocers. I will have to try this recipe soon! Yum! Now I need to go and look up a bottle gourd and see what it looks like so I know what to grab when I whip up a batch of this delicious soup! Thanks for stopping by my site so i could find yours. Your soup looks great! I LOVE Indian food and I am so happy to have found a blog that shares Indian recipes! As a kid I hated this vegetable and did not touch any curry made with this. But now things have changed. I love anything made with this. Sadly, can't get my kiddo to eat this:) That soup looks so delicious. Beautiful pictures. This subzi is my fav too..simple, hearty and healthy. Now this pictures are absolutely divine. It sounds spicy, which I love! Delicious photos as well! Take care! This looks warm and delicious!